This painting was created in November 2015. It shows a summer evening waterfront scene on the river bank at Riverside park, Southampton. 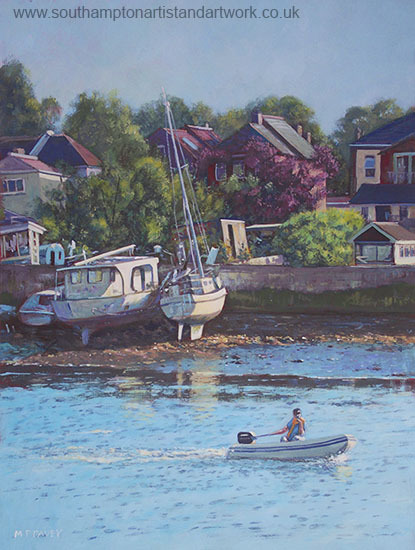 The river flowing through the scene is the River Itchen. At this location on the suburbs of Southampton are a number of properties with gardens backing on to the river. On the river itself are a number of boats resting on the mud as the tide is out. The painting is done on heavy paper using acrylic paint. It is 16" x 12" in size.